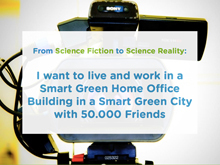 Archive for tag "Smart Green Capital"
Ecosummit TV: We want to live and work in a Smart Green City. And we like London. The smart green capital is an important cleantech hub, provides access to the UK market and serves as the bridge to America. Therefore, we are very proud to invite you to Ecosummit London 2013, our 6th cleantech conference for startups, investors and corporates. ECO13 London will be held on 15-16 October at the Crystal, the new urban sustainability headquarter of Siemens in the Docklands. 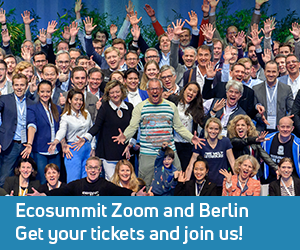 Take a look at our short Ecosummit TV video and get ready for your cable car pitch. ECO13 London explores the city of the future and your company should be part of it. Ecosummit TV: More and more corporates create their own venture capital business units to support external innovation that is relevant to their core business. One of the new kids on the block is Evonik, the German specialty chemistry group with €14.5B revenues and 33.500 employees in 2011. At Ecosummit Düsseldorf 2012, Juergen Finke unveils the investment strategy of Evonik Corporate Venturing. Having started at the beginning of 2012, Evonik dedicated a €100M fund, made 3 fund investments (HTGF, Pangea and Emerald) to run up the learning curve and is working on their first direct startup investments. If your startup matches the strategy and expertise of one of Evonik’s business units, go and talk to Juergen. Smart green corporate venture capital may be your best choice. At ECO11, Klaus Dibbern, CEO of Flinc, pitched his dynamic ride sharing startup to investors and was interviewed by our Ecosummit TV moderator Ane Mari Aakernes. Flinc matches people that want to join the social mobility network to share rides to make money (driver) or save money (passenger). If you share rides in shared cars including taxis then we like to call it Sustainable Social Mobility. That’s the future of mobility. Flinc already has €1.2M funding and looks for a new funding round of approximately €1M. Klaus agreed to share his Flinc slides as PDF. Renate Kuenast, Chairwoman of the Parliamentary Group in the Bundestag, Alliance 90/The Greens, gave a powerful speech at Ecosummit 2011 on 24 March about her plan for the Smart Green Capital Berlin. Our international audience of smart green investors, startups and corporates is the perfect target group. I am impressed by her excellent English and her intelligent ideas for the future of Berlin. 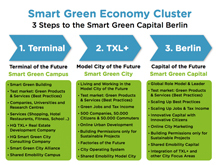 Imagine Berlin to be the leading Smart Green Capital in the leading Smart Green Economy. That’s where we have to be. The good news is that Renate is the Greens’ candidate for Governing Mayor of Berlin in the Berlin state election on 18 September 2011. I am convinced that Berlin needs Renate Kuenast and that’s why I will vote for her in September.